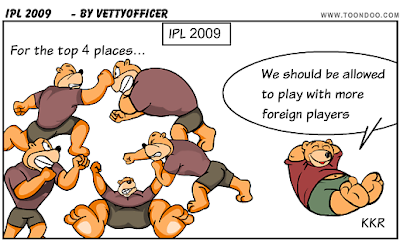 IPL 2009 have reached the interesting phase. One single win take a team to the top slot and one loss take another team to the second half of the poits table. Hope the tournament gets more interesting in the coming days. When every teams are trying their best to rech the semi-finals, its very sad that Kolkata Knight Riders are almost out of the tournament. They do have some of the best players in the game, but unfortunately it didn't click for them this time too. News say that the Kolkatta Knight Riders' coach wants more than 4 players in his playing 11. If this is true - can someone please tell him that this is suppose to be Indian Premier League!!! Even if the KKKR team have missed to make some mark this year, this blogger who calls himself as a fake IPL player from the KKKR team, have certainly made his precense felt in the blog space. I am waiting for the day Bhookha blames global warming for our performance. We wake up, go to the ground, get bashed around, return, go to sleep, wake up, fly into another city, get bashed around again, go to sleep... and the sequence continues.